ANDERSON CO., SC (WSPA) - Deputies are looking for the person or persons responsible for vandalizing a church in Anderson County, SC. The Anderson County Sheriff's Office says someone broke windows and spray painted messages on the side of Midway Presbyterian Church on Midway Road. 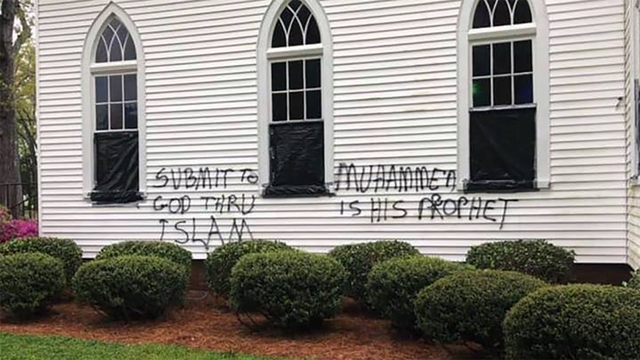 The words "SUBMIT TO GOD THRU ISLAM" and "MUHAMMED IS HIS PROPHET" were spray pained in black onto the siding of the church. "It was very disturbing because we feel like this was an individual act and we don't hold any religious group responsible for it," said Bob Harrell. "We think it most likely was some misguided young people. However, we do take it very seriously and we'll do everything we can to assist law enforcement." Anyone with information on the vandalism is asked to call Crime Stoppers at 888-CRIME-SC or the Anderson County Sheriff's Office at 864-260-4400. A reward is being offered for anyone with information.